Rebel Without a Cause plays as part of a 15-film Nicholas Ray retrospective at New York’s Film Forum from July 31st-August 3rd. What does he know about Man alone? We’re at Ground Zero. Nicholas Ray will forever be remembered as the man who created the icon we know as James Dean. 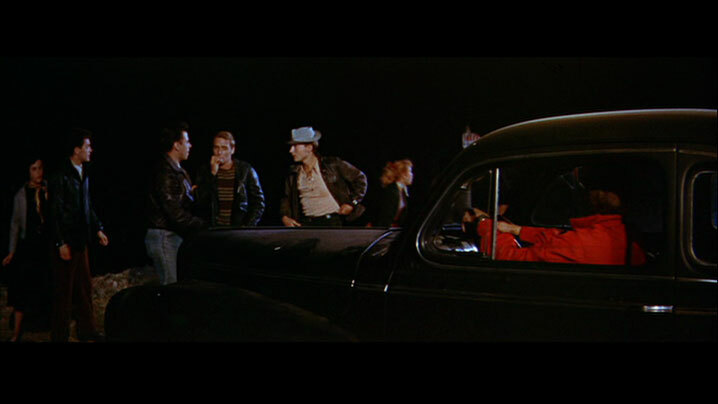 Far beyond the scope of the director’s career, Rebel Without a Cause (1955) stands in for 1950s alienation, for the birth of adolescence as a culturally recognized phenomenon, for the legitimacy of youth culture in the face of adulthood, and for Dean as a figure no longer bound to merely being an actor. 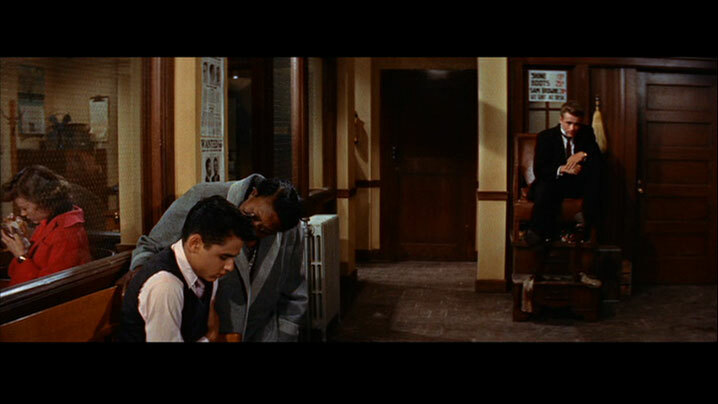 In other words, Rebel Without a Cause is remembered for everything in it except for Nicholas Ray. Or is it? The film represented a turning point in Ray’s career as well: it was his third film as a non-contracted director, and he hoped its success would help him become his own producer. (His efforts ultimately failed.) It was his first film in CinemaScope, a format at which he quickly became a master, but initially didn’t know what to do with (so say some cast & crew who worked with him). The script’s dialogue was derived from improvised rehearsals with the teenage cast, a technique Ray had utilized on his best films, but was now able to bring to its apotheosis. 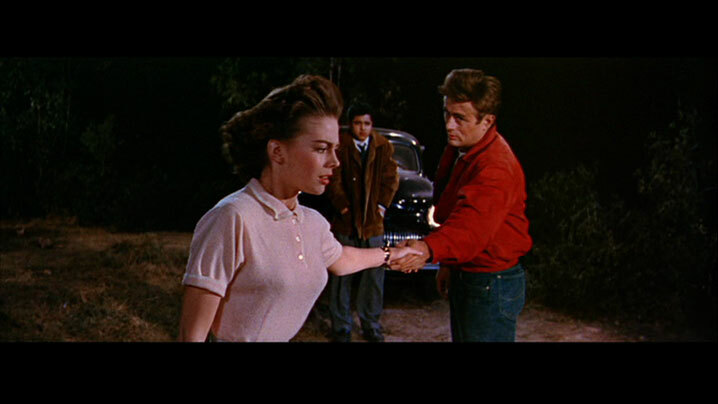 Rebel Without a Cause is very much in keeping with Ray’s best work, but it finds him pushing his techniques into realms of abstraction that They Live by Night, On Dangerous Ground and Johnny Guitar had only implemented within more traditional generic frameworks. To claim that the above three films is merely a film noir, a police procedural, or a Western is folly of the highest order. Ray used those genres as a starting point from which he rendered tropes strange and unexpected. 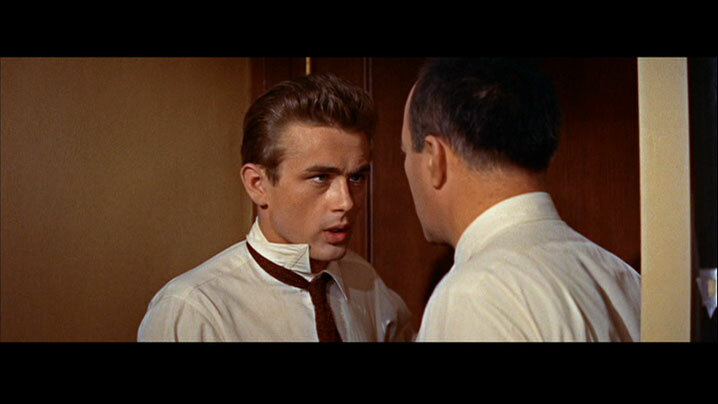 Rebel Without a Cause belongs to no such genre. 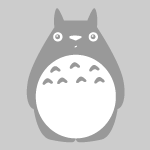 For all intents and purposes, it invented a genre: the teen-problem picture. The organic specificity of dialogue and situation tend to date the film within that context. To claim that the film fits within boundaries that itself created, however, is folly as well. Plot barely factors into the journeys of Jim (Dean), Judy (Natalie Wood) and Plato (Sal Mineo). All that is left is physical and emotional space through which they wander, eventually toward each other. At many points, it is Ray’s most atmospheric film. That atmosphere has a great deal to do with Dean’s performance. One can easily forget the power and originality of his presence with 54 years of iconography weighing on him. The way that only half of his shirt collar stays turned up throughout his drunken arrest is a subtle and typical detail that deepens the strangeness of who and why Jim is. His halting, whispered manner of speech, along with his fluid, balletic body language, indicates Jim’s inability to understand or communicate his emotional conflicts, but it also integrates him into the spaces he inhabits. Jim is another part of his environment, because as he talks, he lets the room do the talking too. Even the most legendary jacket & jeans in cinema history are linked to Ray’s past: Vienna essentially wears the same outfit toward the end of Johnny Guitar. Thus, Dean’s turn as Jim becomes more layered. Feminine is made masculine is made feminine again. Vienna’s colors set her outside the sea of black once Emma and McIivers come for her blood, and as Jim gets ready for the “chickee run,” the explosion of red from his jacket places him outside not only respectable institutions (the nuclear family, the law), but also outside the outsiders, namely Buzz’s (Corey Allen) gang. Jim’s relationship with Buzz points to a trope used by Ray in both Bitter Victory and Wind Across the Everglades. Initially rivals, (although graphically balanced within the frame), Buzz confesses that they are pretty similar, but the “chickee run” must occur because “you gotta do something.” In other words, Buzz is like Jim, but lacks Jim’s awareness of his own alienation from the world. To further suggest their equivocation, Judy almost immediately takes up with Jim after Buzz dies, as though a transference of identity has occurred. Once Ray understood how CinemaScope would be able to push his conceptions of cinematic space to their logical endpoints, he never looked back (Wind Across the Everglades excepted). He immediately revels in the format’s ability to link characters together visually as well as dramatically. Jim, Judy and Plato seem destined for each other from the very first scene, even though they won’t actually come together until much later. In ’Scope, Ray’s emblematic deep focus style can make rooms feel even more cavernous and lonely than their Academy-ratio counterparts. Rather than creating a dream, like Bowie & Keechie, Dix & Laurel, or Jim Wilson & Mary Malden, Jim, Judy & Plato seem to just inhabit one once they enter their mansion, but the film prefigures this chance from the beginning with its atmospherics. This dream is where Jim transforms, thanks to the family the three of them have made for each other. Rather than resting on ill-conceived misogyny to define his masculinity—a trait he wishes his father Frank (Jim Backus) would possess—Jim is at peace when he has the chance to be nurturing. He doesn’t dominate Judy, nor does he condescend to Plato. Their family is built on love, trust and respect. Plato’s death ends the dream, but as Jim staggers out of the planetarium in Judy’s arms, one senses that they could go about rebuilding it, however tentatively. 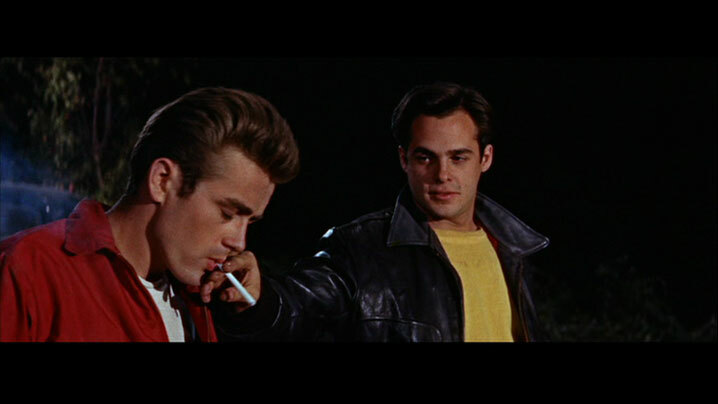 Read “Live Fast Die Young — The Wild Ride of the Making of Rebel Without a Cause” for the whole story about this film, Ray, Dean and just about everythign else that was going on in Hollywood and U.S. culture at the time. “Rebel” is the film for which he will always be rememebred. It’s not is best, but it’s far from chopped liver. That it didn’t supply him with The Big Breakthrough si a result of several factors 1) Dean was dead and the film’s fame is almost entirely about him, hence its status as a fetish object in the Dean cult. 2) The studio system was on its last legs — though few knew it at the time. 3) Ray himself was a real piece of work. Phenomenally talented he was just as phenomenally distracted and self-destructive. Quite a combination. But the films remain and still speak to us in a loud clear voice. “For all intents and purposes, it invented a genre: the teen-problem picture.” Well The Wild One had come out two years before and The Blackboard Jungle came out the same year—but Rebel’s definitely different (as you say) for siding neither with the gangs in exile or bourgeois dependency but accusing both sides of complicity and self-disavowal. As in Sirk (or Shakespeare), it seems like the lovers have to banish the world apocalyptically to create their own very strange family values. And vice-versa. “Rebel” grows better with age. The on-the-nose teenage angst that creeps into a lot of scenes is still dated and a bit problematic, but it bothers me less than it used to when I actually was a teenager. 1) The zeitgeist certainly wrapped the film up in a nice bow, and Dean’s death one month before its release only sealed its fate. The studio system was dying, but I think that Ray’s own behavior contributed a lot to investors and studios thinking that he was unstable. You’re right about “The Wild One” and “Blackboard Jungle.” They provided templates as well. “Rebel,” like all of Ray’s generic experiments, just went further than most people were willing to go. I can easily picture Oshima and Ray on opposite sides of the table, passing the moonshine, juggin’ ‘n’ jawin’ with the best of them. “The Wild One” dealt with bohemian outsiders, “The Blackboard Jungle” with urban youth. 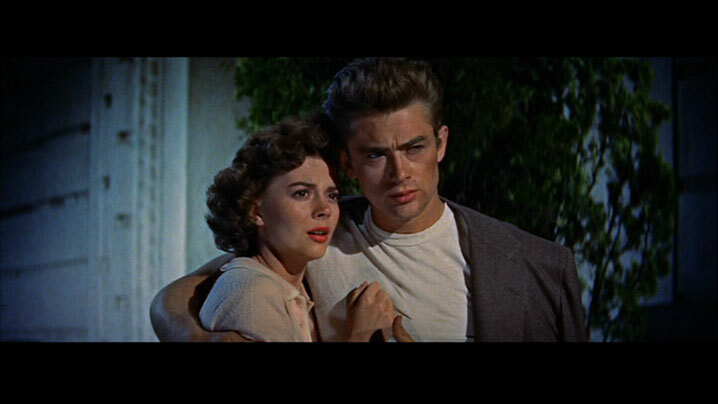 “Rebel Without a Cause” was suburban — and thus quite different. These were supposed to be “kids from nice homes” — thus thier rebellion, such as it was, is more disturbing to the status quo. Exactly. It’s also interesting to note that “They Live by Night” and “Rebel” were Ray’s two personal favorites of his own films—the two which most successfully dealt with the plight of abandoned youth. Dean’s red jacket is burned in everyone’s mind, iconic, but I just realized that Natalie Wood wears a red coat in some scenes. Ray was very aware of the power of color. See “Party Girl” for more visual thrills along those lines.